Control: Say no to low-fee AMC work. Say YES to AMCs worth working for. Click here for an Appraiser’s Ratings and listing of the AMCs you’ll want to work for. Editor’s Note: The following is excerpted from the free insurance webinar Expert’s Corner: Claims, Complaints and E&O Insurance presented by David Brauner, Senior Insurance Broker of OREP.org. First some background. Errors & Omissions (E&O) is malpractice insurance for mistakes in your report- say you measure square footage incorrectly. General Liability (GL) covers property damage and bodily injury while you’re at the premises and more. Examples of GL claims are, if during a walkthrough you knock over and break a vase (property damage), or back over and injure a homeowner as you exit the driveway (bodily injury). Business Owners Packages (BOPs) typically go beyond the job site, providing coverage for losses to your own business, such as a trip and fall at your office, loss of business due to fire or theft, a data breach and other coverages, depending on the policy. The minimum premium for a BOP is about $500. With the increased liability shouldered by appraisers as a result of the new FHA requirements- like testing appliances and the various systems of a house, this coverage is being added by more and more appraisers. Your E&O insurance policy is almost certainly “Claims Made.” This means that for the insurance company to respond to a claim, the claim must be reported while the policy is in force. I agree that it’s confusing and counterintuitive, but all appraiser policies work the same way, and in the end, here’s all you need to know: renew your policy before it expires. As long as the policy has not expired and there is continuous coverage going back to the appraisal in question, there should be coverage. How does a policy expire? It expires if you don’t renew it on or before the expiration date. You can switch carriers at renewal time and keep all your back coverage, as long as you renew before the policy expires and provided the new carrier offers Prior Acts coverage. Prior Acts coverage covers all your work going back to the Inception Date of the policy. The Inception Date is referred to as the Retro Date on most policies, which again, refers to how far back your coverage goes. You’ll find your Retro Date on the Declarations Page, which is one of the first pages of your insurance policy. Check out your own Retro Date to see how far back your coverage goes. Prior Acts Example: a claim surfaces today from an appraisal you completed four years ago; you did have E&O insurance at the time you completed the appraisal. You’ve kept your E&O policy in force (did not let it expire). That claim should be covered now and you are happy and relieved. Here’s the other scenario: you let that policy expire sometime between when you did the report four years ago and when it surfaces. In this case, that claim is not covered, even though you had insurance when you did the appraisal in question, and even though you may be covered today. This does not make anyone happy. Solution: do not let your insurance policy expire. Again, you can switch insurance companies as long as it is before your policy expires and the company you’re switching to provides prior acts (not all do provide prior acts, so ask the question). If you let your policy expire for any reason, you lose coverage for past work. If you’re quitting appraising or retiring, see below. This is the most important information to understand about your E&O insurance. And by the way, we have seen claims recently from appraisals completed as far back as 2005. There are several reasons why you should notify your E&O insurance company immediately of a civil claim from a private source or a complaint from your state board. First, it’s wise to let the experts handle it: many E&O providers have free, anonymous help lines and other expert assistance; some with a zero deductible. Don’t make things worse by responding on your own. If it’s found to be frivolous, chances are your premium will not be affected, or at least not by much. The second reason to report immediately is that most policies include “duty to report” language, which means exactly what it says: you have a duty to report the claim/compliant in a timely manner. Reason three for getting the claim/complaint on the record is that it allows the insurance to do its job and protect you. Imagine this scenario: a seemingly frivolous claim surfaces which you report to your carrier, but hear nothing more about for eight months. In the interim, you let your E&O policy expire either intentionally or accidently. Because you got the claim on the record during the policy period when it first surfaced, the policy should respond to a claim that surfaces later even though the policy is no longer in force and regardless of whether you have current coverage. It is in your best interests to report a complaint or claim right away. If you do not report it and let your insurance lapse, that claim will not be covered later, even though you were covered when you did the appraisal. Seek the help of experts on USPAP and the workings of your state appraisal board before responding or signing any consent decree because, chances are, as it most likely will have an adverse effect on your business, no matter how harmless it may seem at first. We talk a good deal more about this in the webinar. There are numerous documented instances of appraisers being charged with “USPAP violations” by their state board, when in fact, the issues cited were not violations of USPAP at all. Get the help of a USPAP expert first. Next, respond to any claim or complaint professionally and cogently. Furnish a well-thought out, factual, courteous response. If you dash off an error-ridden, sloppy, disorganized reply, it will be assumed that you appraise the same way. If you’re dealing with a claims adjuster at an insurance company, you’ll receive expert help either way, but why alienate someone who is there to help you? Give yourself every chance for success by being pleasant and professional. This also is good advice when explaining a claim or complaint to a prospective carrier you’re shopping after the issue is closed. If you can explain the issues clearly, take responsibility where it’s merited and discuss strategies for ensuring that it does not happen again, you stand a much better chance of being offered insurance terms with multiple carriers, which gives you more choice in deciding who you want to do business with. Not everyone is a good writer but most everyone knows someone who is-reach out for help. Try not to antagonize anyone, especially at your state board. When dealing with your board, be courteous but realize that the process is adversarial in nature. Don’t let your guard down (and seek the help of experts first). If you and your team realize after close review that you made a mistake, admit it and cite any new procedures you’ve created to prevent a reoccurrence. We discuss various strategies in the webinar but the bottom line is, don’t take a board complaint or a civil claim lightly, no matter how busy you are or how frivolous it appears- it can have long-lasting effects on your livelihood. Please disclose claims and complaints to your insurance company. We assume that no one would intentionally conceal a claim on an insurance application, especially in this era of big data. But it is possible, if you’re not careful, to conceal something inadvertently. For example: a homeowner complains to your state board that you are incompetent because his house is obviously worth more than you appraised it for, and he lost the loan. It doesn’t get any more frivolous than this. But we see it happen. Maybe the real estate agent piles on with a complaint of their own because they also are upset over the “killed” deal. You get a letter from your state board to which you respond professionally and with the help of experts. Now you hear nothing for nine months: so far so good. It’s time to renew your insurance and you decide not to mention it on your renewal application because it’s obviously gone away or, if you’re switching companies, you fail to mention it on the application for the new carrier. Even if you’re in a hurry to get the renewal drudgery over with, don’t make the mistake of not reporting it and believing that it took care of itself. It probably didn’t. Find out the status of the complaint from your board and report it, even if it’s closed. If it’s not closed, you can expect a letter from the board eventually with possible notice that the investigation found “USPAP errors” in your workfile. Many times what they find has nothing to do with the original complaint, but they find something they don’t like and now you have a corrective order that you need to report- typically a fine and continuing education. When you report it, the insurance company is going to ask you why you failed to report it when it happened and then later on the renewal application. They will likely respond to the complaint- and any eventual claim that may arise from it, but they may cancel you for concealing the complaint. This makes it harder to get coverage from another carrier in the future (there is always a question on the application whether you have ever been denied coverage and why). If at renewal you switched insurance companies and did not disclose the complaint to the new carrier, they may not respond to the complaint at all because you did not disclose it on the application. After all, they insured you based on a clean record. Folks, you don’t have much to lose by disclosing- chances are a frivolous complaint will not affect the cost of your insurance or the complexity of the renewal process. But the risk is great if you don’t disclose. It hurts to be punished for something you didn’t do but as they say- stuff happens. One thing you can control, however, is not making things worse by hiding the facts. If the application asks you to report any claim or complaint in the past five years, do so, even if the complaint has been formally closed and you’ve been cleared. It should not make any difference. If you are leaving appraising, consider “tail coverage” which covers your Prior Acts, or your past work, completed during the policy period on into the future. You pay for tail coverage one time to cover past work for up to three years into the future. If you’re of retirement age (65), check with your agent, you may be eligible for free tail coverage for life. Choose $1 million in coverage when you’re setting your policy up; that is the minimum for most clients who require insurance. Third party indemnification clauses in many AMC contracts are troublesome but boil down to a business decision. The extra coverage AMCs require is available, however, usually for a modest additional premium- ask your agent. If you are an individual appraiser, purchasing an individual policy should be adequate. Individual policies are not intended to cover multiple appraisers; that’s what group policies are for. Keep your workfiles forever- it’s hard to defend yourself without it. If you have E&O insurance (95% of those who attended the free live webinar say they do), don’t worry- it’s the single best protection you can have. In the 20 years I have been selling appraiser’s E&O I have never heard of an insurance company failing to respond as they should (it’s called a duty to defend). Rates are down (slightly). The volume of claims we see is also down from the dark days following the financial collapse. While there are plenty of state board complaints, the frequency does not seem to be increasing. 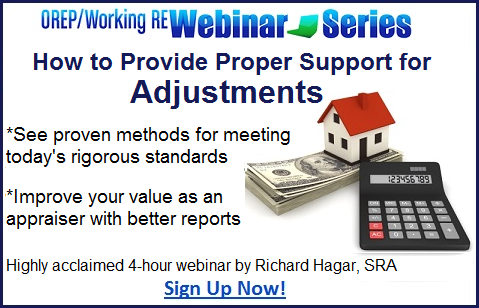 One in four appraisers who attended the webinar said they had had a board complaint; one in 10 said they had a claim. There are a couple of well-publicized “slip and fall” attorneys who have appraisers in their crosshairs these days, which is worrisome, but the truth is, if you have E&O insurance and get snared in one of these scams, report it to your carrier and go back to work. It won’t be pleasant but you should be covered. CU Version 3.0 is coming this September, promising “improvements” and enhancements that will undoubtedly affect how appraisers interact with their lender and AMC clients going forward. Be prepared! CU continues to flag appraisers for unsupported adjustments and erroneous Q&C ratings. In this upcoming two-part webinar, Richard Hagar, SRA shares the latest intel from his recent mettings with Fannie Mae. He shows appraisers, step by step, how to avoid the most common appraisal failures and how to “get it right” with Q&C ratings. Sign Up Now! 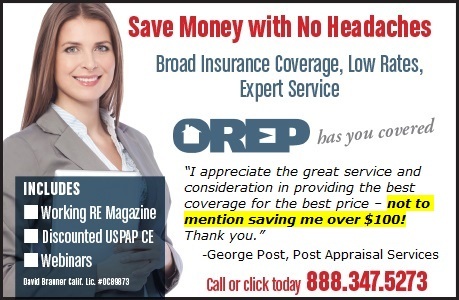 David Brauner is the Senior Insurance Broker for OREP.org and Publisher of Working RE magazine. He has been involved in providing E&O coverage for appraisers for over 20 years. >New: Collateral Underwriter Blog: Find answers, offer solutions. FHA should cover appraiser accidents, as they created the insanity. The homeowners policy should also cover the accident. Just like if I had a slip and fall on my property. I am liable. If an appraiser falls through my ceiling, my insurance company would be sued. Long term disability insurance is a different thing. Also, who in high heaven ever pays insurance for the past liability? Not Doctors or lawyers. 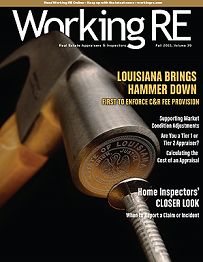 Why are appraisers liable for claims 4 years prior when they had insurance at the time. 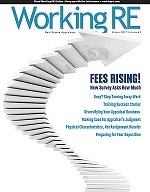 More fleecing of appraisers, that is why more appraisers are leaving the field forever. Am I a Working RE Paid Subscriber? Copyright © 2013. All Rights Reserved by Working RE Magazine.